London, April 11: Wikileaks founder Julian Assange has been arrested at the Ecuadorian embassy in London. 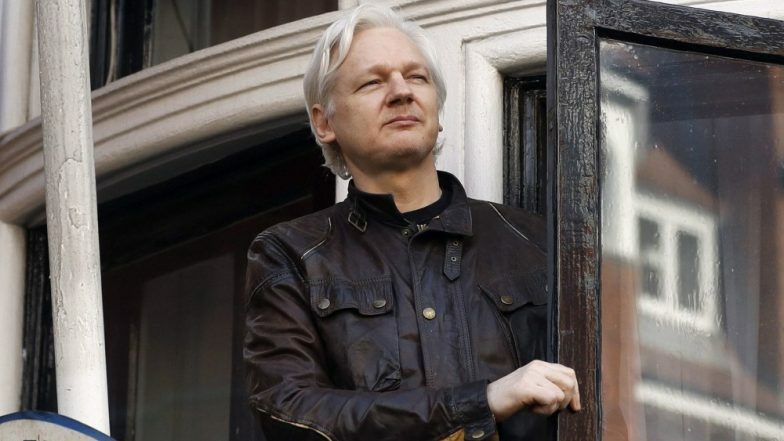 The Scotland Yard in a statement said, “Julian Assange, 47, has today, Thursday, 11 April, been arrested by officers from the Metropolitan.” The WikiLeaks founder was arrested on a warrant issued by Westminster Magistrates’ Court on 29 June 2012, for failing to surrender before the court. Chelsea Manning Jailed For Not Testifying Before Grand Jury in WikiLeaks Case. As per reports, Assange was taken into custody at a central London police station. He will be presented before the Westminster Magistrates’ Court. According to London’s Metropolitan Police, the Ecuadorian government has withdrawn asylum for Assange. WikiLeaks Accuses Ecuador of Spying on Assange at Embassy. The Wikileaks founder is an Australian national. Assange founded WikiLeaks in 2006, and came to international attention in 2010, when WikiLeaks published a series of leaks provided by Chelsea Manning. In November 2010, Sweden issued an international arrest warrant for Assange. During the 2016 Democratic Party presidential primaries, WikiLeaks hosted emails sent or received by candidate Hillary Clinton from her private email server when she was Secretary of State. However, Assange consistently denied any connection with Russia in relation to the leaks.